The U.S.S. 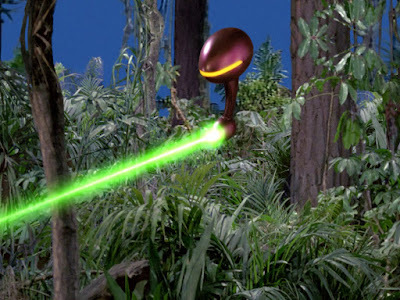 Enterprise visits the Arcadian star system and the mining planet Mother-lode in search of the con-man Harry Mudd (Roger Carmel), who is wanted in the Federation for fraud and swindling. Harry surrenders rather than face the wrath of the miners when they learn that he has falsified the results of the love potion he is currently peddling. Once aboard the Enterprise, however, Mudd provides a sample of his love potion to Christine Chapel (Majel Barrett), who soon uses it on Spock. The “love crystal” has its desired effect, and transforms Spock into a love-sick, emotional basket-case. 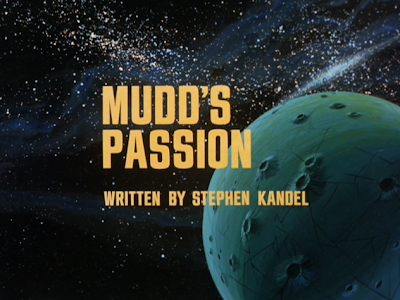 As a series that so often distinguishes itself as an avenue for mature, cerebral, sci-fi storytelling, it’s always a shame to witness a Star Trek: The Animated Series installment like “Mudd’s Passion,” which is a sequel to “Mudd’s Women” and “I Mudd,” but which treats its subject matter -- a love potion -- in a highly juvenile fashion. 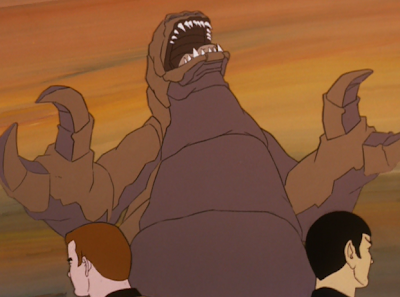 In particular, the episode resolution, which finds giant rock dinosaurs falling in love with each other after exposure to the “crystals” is rather childish and silly. 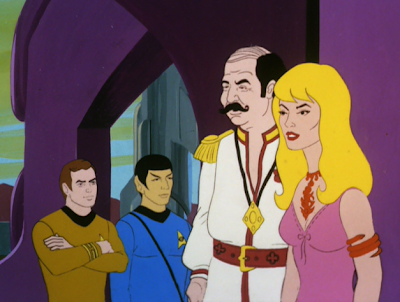 This episode seems to forget that the character is a professional woman, and a Starfleet officer to boot. No matter what her romantic feelings for Mr. Spock, it hardly seems likely Chapel would work with a scoundrel like Harry Mudd simply to make the science officer fall in love with her. 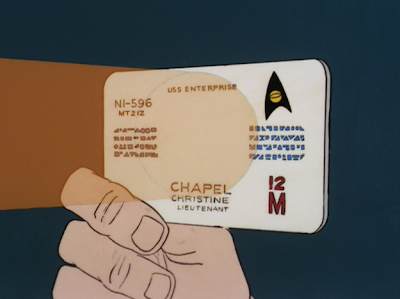 Similarly, Chapel essentially slips a fellow crew-member an illicit, untried drug, and again, that seems like a court-martial offense. 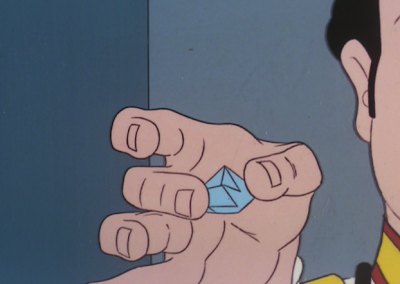 What if the crystals had killed Spock? What right had she to impose her will on him, using a dangerous substance? I’m not a stickler for characters acting “perfect” (a la The Next Generation), but Chapel’s behavior in this episode is absolutely terribly, and unworthy of a Starfleet officer. Yes, she makes a mistake, but this mistake is also a considerable lapse in judgment. In toto, “Mudd’s Passion” doesn’t even cohere very well as a narrative. Chapel and Mudd just happen to leave the Enterprise for a planet inhabited by giant rock monsters? And there just happen to be two of them (and a male and a female, at that?) The word “contrived” doesn’t begin to cover the nature of this particular story. It's all designed to be funny, and charming, but again, just transmits as kind of insulting. Despite such problems, "Mudd's Passion" does boast some virtues. For one thing, this episode provides a great, rare close-up view of the U.S.S. Enterprise’s amazing shuttle deck, and fleet of shuttles. 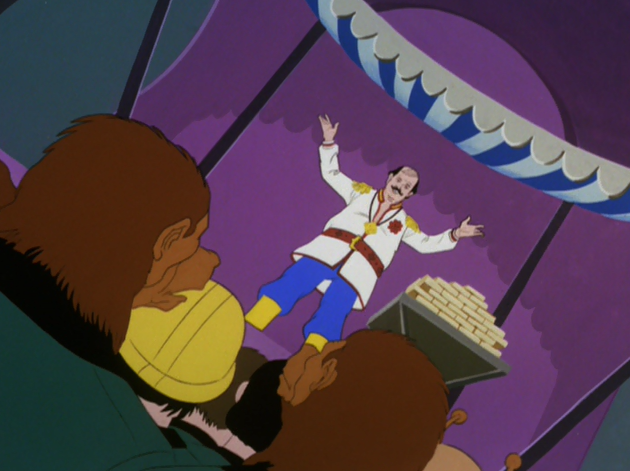 And for another, the episode attempts to make the wholly worthwhile point that you can’t make one change in a person without that change having a kind of domino-effect. The love potion works all right, but the period of love it generates is followed by a period of intense hate. Like everything in life, there is a cost to getting (by force and manipulation) what you think you desire most. John, I hope your family's summer is going well. A very accurate review of "Mudd's Passion". A childish sequel to TOS Mudd episodes. As a young boy, I watched this first-run on Saturday morning during the 1973-74 season. Unfortunately, they chose to simplify it too much for us. 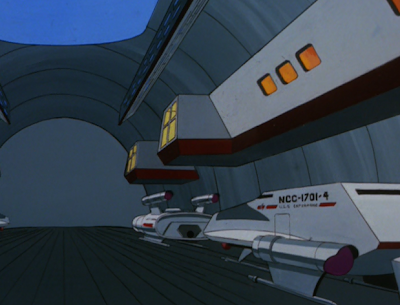 The high point of the episode for me, like you, was seeing the hangar deck with all the various shuttlecrafts. I have to highly disagree here. I thought the episode was thought provoking, touching and a testament to how far television had come. Oh, who am I kidding, your review nailed it.